Scheduling is essential for temporary staffing firms with dynamic workforces and many people to schedule. But assigning placements and communicating shift changes can be time-consuming and difficult. When there’s a problem with scheduling, it’s hard to meet and exceed client expectations. That’s where scheduling automation comes in. Shiftboard’s scheduling and workforce management capabilities make it an effective staffing firm scheduling software. From increasing fill rates to improving retention, Shiftboard’s staffing firm customers see the benefits. Responding quickly to client requests with great candidates is key to growing revenue at temp staffing firms. Shiftboard gives you instant visibility into your candidate pool, helping you fill requests quickly. You can instantly access a shortlist of available candidates who have the right skillset. Sign-up lists, standby lists, and pickup options make it easy to fill last-minute requests. On average, our staffing customers create and fill shifts 53% faster than before switching to Shiftboard. Every temp staffing agency dreads having a client contact you in a panic because your workers didn’t show. Employee scheduling software configured for staffing can help. Shiftboard equips you to avoid nightmare scheduling situations, providing you with the tools to direct your workforce and respond to last-minute needs. In addition to greater shift coverage visibility, Shiftboard makes backfilling call outs and no-shows simple, even for large staffing agencies. Shiftboard automatically finds a replacement, reassigns the shift, and communicates the shift details to the replacement. The scheduling process at a temp staffing firm can be chaotic. Managing the work schedule can be time-consuming. 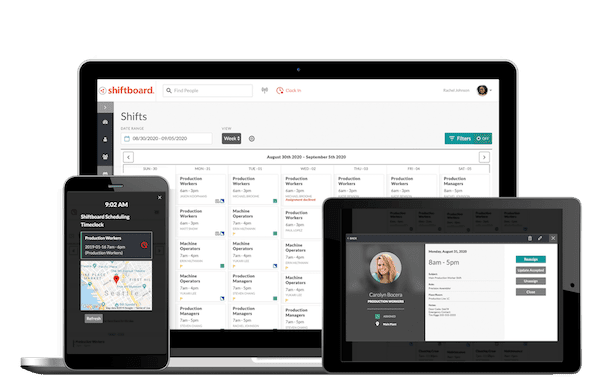 Shiftboard’s staffing agency management capabilities include automated scheduling, workforce communication, and a worker portal. All of these features help your recruiters reduce their time spent managing schedules day to day. This frees up their valuable time to focus on more important tasks, like securing more placements. With Shiftboard, temp staffing firms see an average of 55% increase in scheduling efficiency, leading to lower labor costs and highly productive recruiters. Retention can be a challenge for staffing firms. Fortunately, Shiftboard enables you to keep top talent engaged, happy, and self-sufficient. Our mobile app gives workers the ability to add availability preferences, see potential assignments in real-time, and request “hot” open assignments that are posted. By switching to Shiftboard, our customers report a 40% reduction in worker turnover. Auto Assignments — Manually matching workers to jobs is time-consuming and error prone, particularly when you have a large workforce to schedule. With Shiftboard, you can instantly see which candidates meet your requirements and even auto-assign based upon custom assignment rules. Standby Lists — Eliminate the chaos of trying to fill last-minute job requests. Use Shiftboard’s standby list functionality to establish an on-demand candidate pool. Shift Trading — Regardless of how perfect the initial scheduling effort is, there will be times when workers become unavailable. Give workers flexibility and lessen the burden on schedulers through Shiftboard’s shift trading feature. Mobile App — Offer an anytime, anywhere access point for your workers. From checking schedules to clocking in to viewing directions for the job site, Shiftboard’s mobile app puts all of your essential information at their fingertips. Broadcast Emails — Repeating one-off emails to individual workers can take up valuable time. Shiftboard’s highly versatile email tool allows you to send bulk communications to your entire workforce, select groups, or a handful of individuals. Text Alerts & Shift Confirmation — When time is of the essence, as it always is for staffing firms, real-time communication is critical. Shiftboard offers both broadcast and two-way texting options to keep your workers up-to-date on new information. Workers can also accept shift assignments through a text confirmation. Time clock — Shiftboard offers several time clock options, making it easy for in-the-field workers to clock in and out, including mobile check-in, QR codes, and interactive voice response. Recruiters and managers can also see who is clocked in at any time. Hours Tracking — Hours worked are automatically logged, along with pay-rates, overtime eligibility, and other data on individual workers. Managers are able to reconcile hours by matching to assignments and client records. Integration to Payroll — Shiftboard integrates with hundreds of payroll providers to streamline and simplify operations. From fully automated integration to exporting timecard files in a specified format, Shiftboard can accommodate your firm’s needs. Applicant Screening — Streamline your applicant screening process. Capture applicant information via an online form and route that information through a customizable applicant screening workflow. Training & Credential Tracking — Ensure your workforce is ready for assignments. Shiftboard tracks optional and required training completion. Alerts are automatically provided for expiring credentials to maintain compliance. Worker Pool Segmentation — Simplify worker scheduling and communication by organizing your workforce into virtual groups. Group your workforce by a variety of categories, such as skill, role, location, client and many more. With Shiftboard the options are nearly endless.